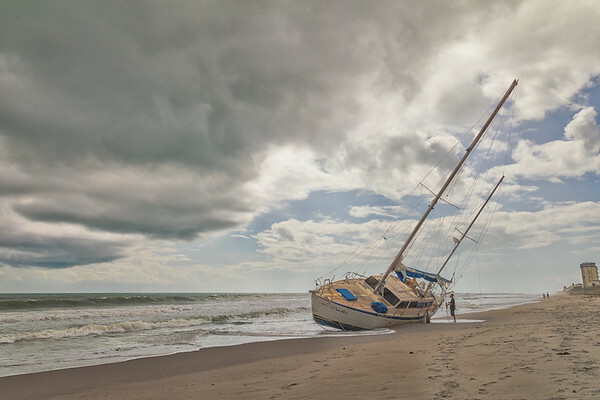 Views of the sailboat "Cuki," washed ashore in Melbourne Beach, Florida after Hurricane Irma. The "Cuki", aka "ghost boat" from the air this morning. It's turned into quite the tourist attraction. It was only 10 am and a steady stream of people had started to show up to visit, and in this case, pose for pictures. And, congratulations to Ian Gronosky / Ian Gronosky Photography, whose great "Cuki" photos were featured in Florida Today and USA Today. If you're looking for the unseemly back-story of this 45-foot sailboat, Rick Neale's coverage has been great. 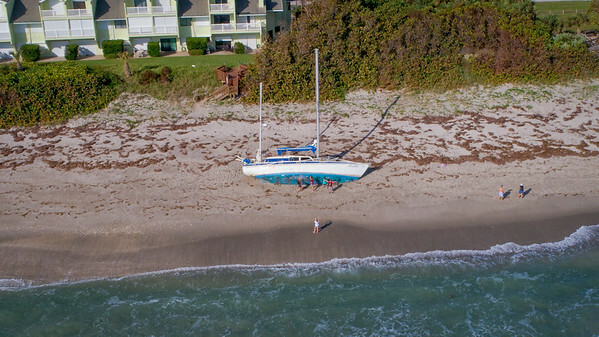 Morning in Melbourne Beach, Florida: The beached sailboat "Cuki" (still there) and a guy on a surfboard. 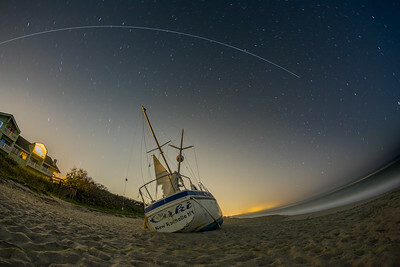 A few of my favorite things, and all before sunrise: beach, stars, "Cuki", night photography and the International Space Station. I got to wave "good morning" to the International Space Station and its crew of six at 6am this morning (including Scott Tingle and Joe Acaba), seen here flying over the Space Coast of Florida in a single, 191-second exposure. #SpotTheStation Details: ISO500, f5.6 and 191-second exposure, shot with a Rokinon 12mm fish-eye on a Canon 5D4 (full-frame) camera. 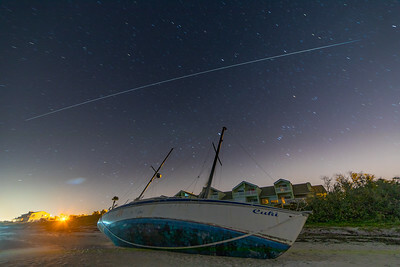 Heavens-above.com predicted a pass of the International Space Station that would be visible to the Space Coast. 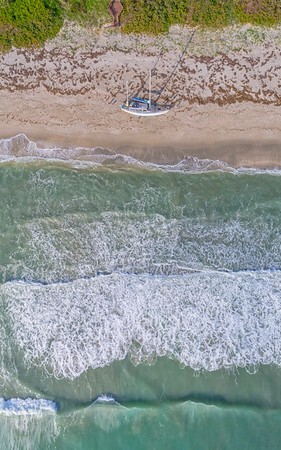 It was lower and dimmer than I would generally chase, but I still went to my favorite spot, the "Cuki," a sailboat in Melbourne Beach, FL that was washed ashore after Hurricane Irma. It was cloudier than expected, and I was a bit disappointed by how undramatic the streak turned out until I later looked at the ground track of the Station. At the time of the left-most section of the streak shown here (over the condos), the Station is over the Gulf of Mexico, well south of New Orleans, roughly 1,000km away. The closest the Station would come was 750km, roughly over the sailboat in the streak, and somewhere over Alabama east of Montgomery. And, as it enters the shadow of the Earth (after emerging from behind the cloud in the right section of the frame), the Station is nearly 1,100 km away, cruising over (roughly) Blacksburg, Virgina. New Orleans, Alabama, and Virginia. And we can see it from Florida. Kinda cool, no? Details: This is a composite of two 120-second exposures, shot at ISO400 and f6.3 with a Canon 5DIV and a Rokinon 14mm lens. Initial edits done in Lightroom, composite done in Photoshop (while avoiding the temptation to draw in a bolder streak) and edits were done (again) in Lightroom, then Color Efex2 (detail enhancer) and then some noise reduction was applied with Dfine2. What does one plane, a rocket body, a beached sailboat and the International Space Station all have in common? They all appear in this #SpotTheStation image. With apologies to the man and woman I unintentionally chased away from the boat, this is a single, 170-second exposure taken tonight (February 13, 2018) in Melbourne Beach, Florida. The plane is the faint dashed line that runs from the top right cloud toward the stern of the boat. The rocket body is the faint line pointed toward 7 o'clock in the top left corner of the frame, to the left of the rather bright star (itself also a streak, due to the rotation of the Earth). According to heavens-above.com, this is the OAO 1 rocket, an Atlas SLV-3 Agena D launched on April 8, 1966, from Cape Canaveral Air Force Station. The sailboat, at this point, needs no explanation. The "Cuki" is one of my favorite subjects, still beached after Hurricane Irma. And, flying over the mast of the sailboat, the brightest, longest streak in the frame, is the International Space Station. When I arrived at the boat about 5 minutes before the pass, there was a couple seated on chairs near the bow of the boat. I was hurried and didn't take the time to let them know that I wasn't photographing them per se, nor did I explain that they might have made neat subjects if they stayed put. They split and may well have been perturbed to have been bothered. (Sorry.) 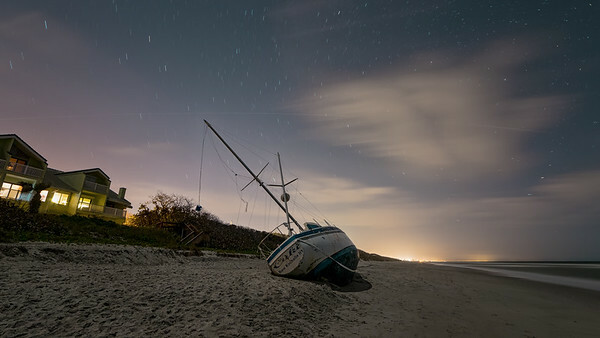 Photo details: ISO500, 170-seconds, f5.6 with a Rokinon 14mm on a Canon 5D4. Post-processing involved trying to mitigate the pesky clouds with a fair amount of detail work in Lightroom and Color Efex4. 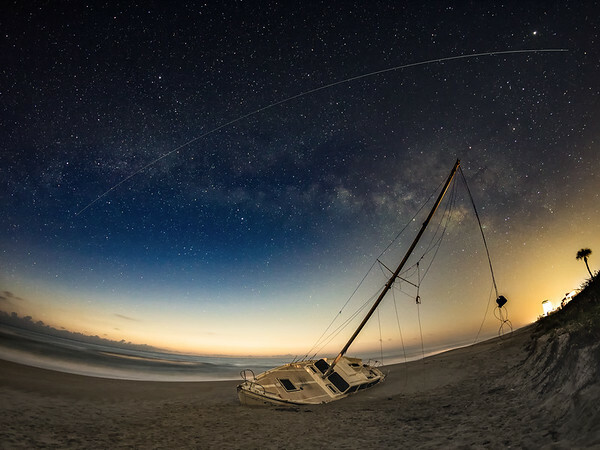 International Space Station, the Milky Way and a wrecked sailboat. The Cuki Way, or maybe Milky Cuki? The skies were finally clearer this morning for me to attempt the shot I've been wondering about since I first saw the "Cuki" wrecked in Melbourne Beach. 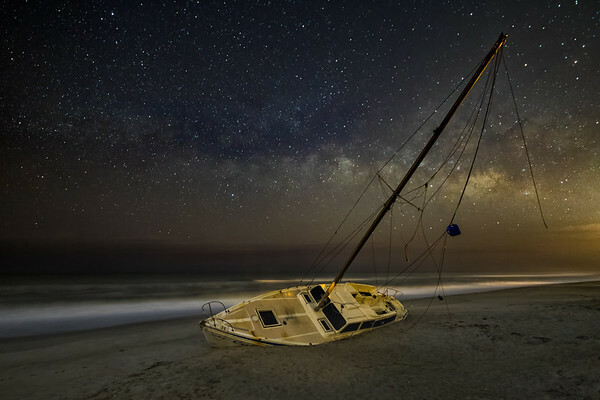 There's this window around this time of year where the Sun rises just late enough to be able to catch the Milky Way hanging out over the Atlantic, and I wouldn't have thought the sailboat would still be there five months after washing ashore, but, it is. 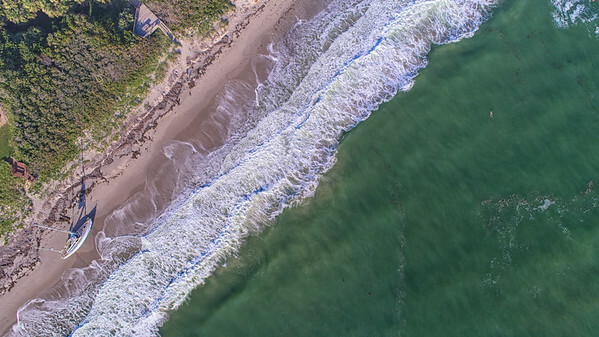 So I made an early morning trip to Melbourne Beach, and this is the result. The start of morning nautical twilight was at 6:08 am. I started shooting pointed more toward the east at 4:30 am, but the Milky Way was too low on the horizon, and this image was captured at 5:15 am (pointed more toward the southeast), and I left shortly after that. I wanted to shoot the Milky Way when it was as high in the sky as possible (so, later), but that also meant the dense areas of the clouds (the prettiest) were moving more toward the south, and therefore, toward more light pollution. 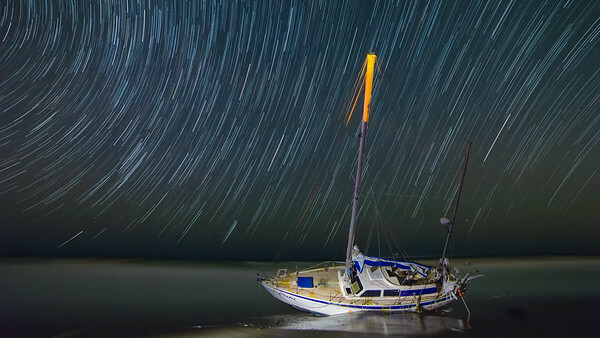 As I learned last year, the Atlantic Ocean and Florida, in general, conspire to make winter Milky Way shots soft. Mist from the surf, humidity, dew (although, it was a comfortable 68 degrees at the time of this shot) and light pollution (the Space Coast hardly qualifies as having dark skies; you have to travel well-inland for that) were all working against me this morning. I may revisit this image (and, sorry Chris Cook, I also included a flashlight shot in the series that I may have to process) when I have more time, but for now, here it is, pushed pretty much to (or maybe beyond) reasonable processing limits. It is a spectacle of dehaze and saturation adjustments, and I shudder to think about what Facebook will do with the image. Details: ISO3200, 30-seconds at f2.8 with a Rokinon 14mm on a Canon 5D4. Initial edits were done in Lightroom, and then Color Efex4 (detail extractor) and the final edits were done (again) in Lightroom. 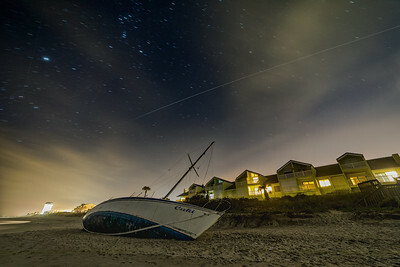 Three of my favorite subjects: The International Space Station, the Milky Way and, of course, the still-beached sailboat named "Cuki", captured in 2 frames this morning in Melbourne Beach, Florida. Frame 1 is the Milky Way, taken at 5:48:30 am (ISO3200, 25 seconds, f2.8) and then the second frame was at 5:49am (immediately after the first frame, ISO500, 169-seconds, f5.6) is the ISS, streaking over the Space Coast, heading out over the Atlantic Ocean. And, I was using the Rokinon 12mm Fish-eye for this one, mounted on a Canon 5D4 (full-frame) camera. In my first version of the composite, the star trails were cool, but distracting, because only the brightest stars left trails. So, this composite is only the ISS streak from the second frame, merged using the "lighter color" setting in Photoshop. Also, this was all just before the official start of Nautical Twilight, but (as you can see) the color coming up on the horizon is very apparent.